If you are looking for a faultless finish then our correction detail is what you require. 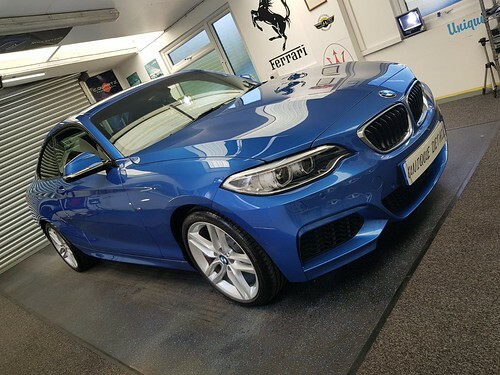 The Full Correction Detail corrects major paint defects/marks and restores cars of all ages to in most cases better than showroom condition,Our correction detail is for the real perfectionist and thats exactly what we will give you!! !… Total perfection for the most discerning of clients. We do offer a mobile service for the correction detail as long as there is off road parking and the weather is dry or you have a workshop or garage to provide us with. Please Remember : Our detailing Unit is situated 3 minutes from junction 12 of the M1 & 8 minutes from the nearest railway link, a courtesy lift is available too and from the railway station. What Is Car Paint Correction? Good paint correction requires a high degree of skill and concentration, but done properly, it really can transform the look of a car by dealing with (amongst other things);poor washing techniques (local hand car washes) hard water marks, etching caused by bird muck or fly squash, swirl marks, scratches and fading. Done professionally, paint correction is entirely safe and will not cause any issues for your paint. Vehicle Rinsed down and re-dried. A 2-3+ stage paint correction treatment using a rotary machine polisher and various pads which will remove deeper paint swirls/marks, light scratches, hologramming, oxidation and marring. Vehicle re-washed to remove dust and compounds. Vehicle re dried using microfiber towels and warm air blowers. Pre-wax cleanser applied to paintwork. Pre-wax cleaner removed by dual action polisher. Sealant buffed off to leave an unravelled protection to your cars finish. (swissvax) this not only gives added protection but gives gives that high gloss show car finish and takes the car back to in most cases better than showroom finish. Wheels coated with 2 layers of wheel protectant. Tyres coated with long lasting tyre gel. 30 stages of vigorous cleaning are undertaken in this detail. 3-10 DAYS ARE REQUIRED DEPENDENT ON THE SIZE AND CONDITION OF THE VEHICLE. Prices for the Full Correction Detail are dependent on the size condition & Location of the vehicle. Viewing of the vehicle is Prefered prior to pricing of the work. The reason most people have there cars wet sanded is to remove orange peel in the clear coat,wet sanding is Extremely time consuming and not for the faint hearted in the wrong hands and without the right knowledge and equipment it spells disaster. What is Orange Peel ? Most paintwork corrections can be made with a rotary polisher but in the case of heavy orange peel in the clear coat its not always achievable so this is why we wet sand, wet sanding done correctly takes many stages of sanding before the paint is ready for machine polishing starting with 2000grit through to 4000grit sand paper you can and will achieve a flawless show car finish with a crystal clear reflections after the machine polishing is completed. Before wet sanding can commence PDG reading are taken on each and every panel to make sure there is enough clear coat to safely wet sand the vehicle this process of taking PDG readings is undertaken through the sanding opperation,Most cars have an average of between 100 – 140 microns,removing between 7-10 microns will remove most blemishes, Orange peel, swirl marks, mild scratches, bird stains etc.